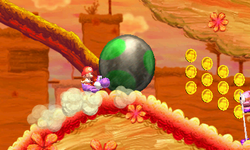 Metal Eggdozers on a Roll is the fifth level of World 4 found in Yoshi's New Island. Yoshi starts the level in a desert-like area with some enemies and Metal Eggdozers which must be used to clear a path to the Checkpoint Ring and a door. It leads to an underwater area with Maces and a pipe. It leads to an area with a Metal Eggdozer and the Goal Ring. This page was last edited on April 15, 2019, at 12:09.